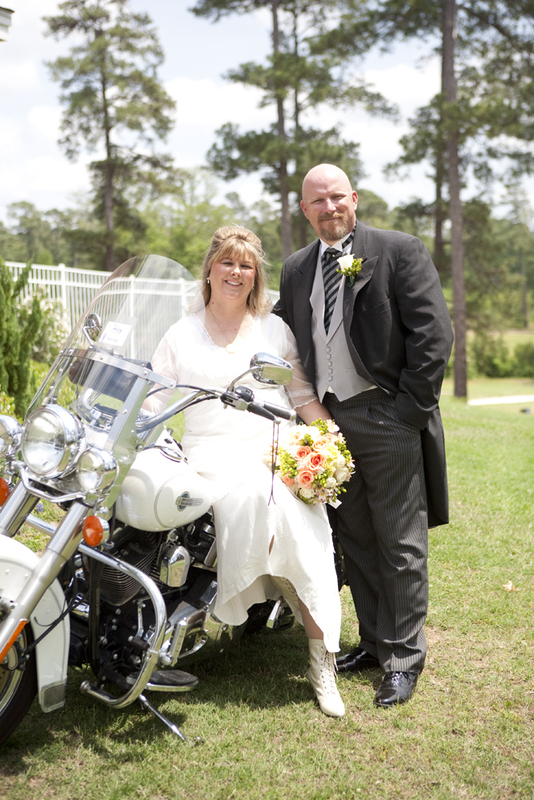 April 23, 2011 I did find the perfect man...we got to use both of our motorcycles in our wedding! My brother always loved motorcycles and let me ride his mini-bike when he got it one year for Christmas which I promptly ran into the chain link fence. After that I just figured I would always ride on the back with someone else. Well I was about to turn 50 and I guess I wanted to begin a new stage in my life. I sold my 1937 Buick named Olivia and promptly bought a 2004 Harley Heritage Softail Classic. I didn't even know how to ride the bike when I bought it! 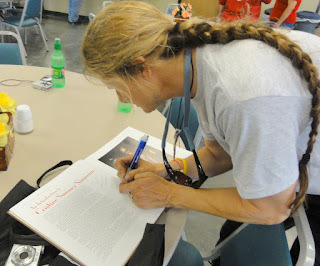 I promptly signed up for the Rider's Edge Class and to my amazement passed. For a year I rode in parking lots and many back roads before I became brave enough to venture out. I LOVED IT! I felt so free and the thrill was overwhelming. It brought tears to my eyes on several occasions. My brother passed away in 1996 and I like to think he smiles down and protects me everytime I get on my bike. I still love to ride on the back with my husband when I am not in the mood to think and just want to take lots of pictures; and he is ok with that most of the time. Sporting my Life Starts At The Edge Shirt After I Passed! 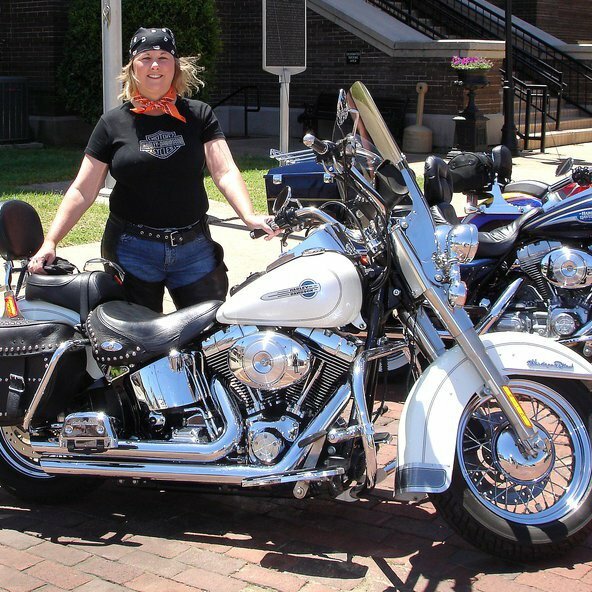 I am such a nostalgic person that when I decided I wanted my own motorcycle which to me could only be a Harley I started doing research on which groups I wanted to be a part of. I had seen Cris Sommer Simmons on CBS Sunday Morning Show talking about her new book "The American Motorcycle Girls", it sparked a fire! I later saw where Chris would be in the Cannonball Run and it would be coming close to my area of the country. I took off to Danville, Arkansas. I had ordered books by Cris and wanted to get her to autograph them for my girlfriends that also rode their own! I met Cris and saw that she was a Motor Maid. A girl and her motorcycle...What more could a girl ask for on a nice sunny day! Ronnie Hennigan happen to come in the Museum where I serve as the Director one day and I couldn't believe it. He was just who I wanted to talk to and asked him to please tell his wife I wanted to talk to her and join. A few weeks later in walks Miram Hennigan into my life. In life they say there are no strangers only people we haven't met yet and so it was with Miram. She is fearless for sure. I am more a fair weather rider so far but my love of what being a Motor Maid is strong and I think that is what counts with me for now. 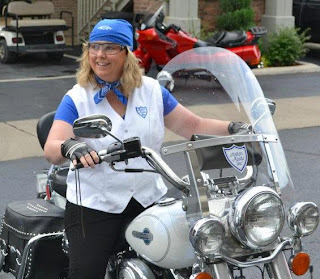 Riding Into A Life Of Women In Motorcycle History! The fact that this organization is the history of Women In Motorcycling is very important to me!